Today’s topics: Pope John Paul’s lessons for how to elevate our work into a vocation. 1st segment: Fr. Matt joins the program via phone. He’s on a planning retreat for his office. He spent the Triduum on the Hunger for Justice retreat for teens. Holy Week is the Super Bowl for priests. About 200 teens from the northern part of the archdiocese came together for the retreat on which they fasted for 30 hours. Their fasting was sponsored, each one raising about $250. They raised about $15,000 total for Japan earthquake relief. They started on the beach in Nahant with a theme that sin leaves us homeless because sin alienates us from the Lord, from each other, and ourselves. We are outside the loving embrace of the Lord. But the cross of Jesus welcomes us home. They had Good Friday service at St. Thomas Aquinas in Nahant, then went back to St. Mary in Lynn where they had a final meal for the fast. On Saturday they served the homeless in Boston. One man in a wheelchair told one of the girls how he sometimes finds himself sleeping in a garage in a sleeping bag. He had only a thin shirt under his jacket and the girl gave him her own sweatshirt she was wearing. It was raining all day, but they didn’t have a rain contingency. The homeless get rained on whenever it rains, so the kids took part in solidarity with them. It helped them appreciate the blessing they have and what the homeless go through. Toward the end of today’s show, we will answer listener questions about the Holy Father’s Beatification. 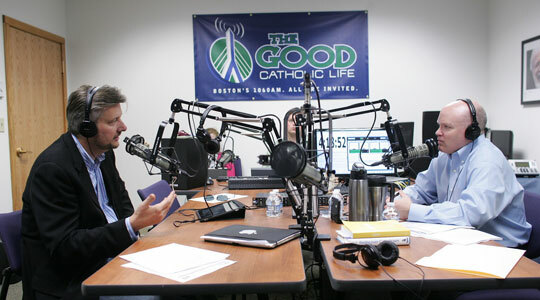 If you have a question, please email LIVE@TheGoodCatholicLife.com, text or call us at 617-410-MASS. 2nd segment: Andreas Widmer joins Scot and Fr. Matt. Andreas was on the show a few weeks ago and he shared how he became a Swiss Guard and his first encounter with Pope John Paul II. Andreas has since studied John Paul’s life and has written a book, “The Pope & The CEO: Nine Lessons in Executive Leadership Learned by a Swiss Guard at the Feet John Paul II” (coming soon from Emmaus Road) on how to apply those lessons to his life. After the Swiss Guard, he entered the high-tech industry and went through the ups and downs of the tech boom. In the downs of life, you can sometimes find God more easily. In one of those downs, he started to think about those lessons of John Paul. Vocation is often talked about in the sense of a religious vocation, but John Paul made sure to emphasize that vocation is whatever mission we are sent from God. 98% of Christians have a vocation outside of religious life. John Paul said you know that when you’re working well, you don’t just make more, but you become more. Is my job helping me to become more? How do you approach your job? How do you see your job? How did John Paul teach someone to find their specific vocation? Andreas said John Paul would say that God is asking you what you are going to do with all the talents and opportunities He has given you? We present what we are going to do and then God will bless us and help us to excel in life and become a saint. Fr. Matt said Pope John Paul II wrote a letter to young people in 1985, Dilecti Amici. John Paul saw young people as the hope of the future. In the letter, he identified adolescence as a time of intense discovery where we ask what is our life’s project. God has created us in a particular time and place for a purpose that we have to discover. In our culture, we are constantly surrounded by noise and distraction and it keeps the heart and soul from listening. That’s why Eucharistic adoration is so powerful. When Fr. Matt was first thinking of a priestly vocation, his dad went to an Oblate priest and asked him about it. The priest asked if Fr. Matt prayed and if not then he didn’t have a vocation. Andreas said the second chapter of his book is about prayer and it comes after the first chapter on vocation. The Church gives us many ways to pray. It is our particular way to have a loving relationship with the Lord. Be careful not to fall into the trap of going before the Lord and “putting in your order.” It needs to be a two-way street. It’s okay sometimes to just go and sit and listen. Some prayers can help you to calm the mind and then have a period of silence at the feet of Christ. 3rd segment: Andreas observed John Paul’s prayer in his time as a Swiss Guard. One of the key experiences was once during a rosary on Vatican radio with the Pope and about 50 other people. The pope was kneeling and Andreas was standing in front of him looking out at all the people. Andreas suddenly felt different, he had a peace that he hadn’t felt before. Andreas thought, “Whatever this guy has, this peace and humanity, that’s what I want.” Many people would tell Andreas how they would find the Holy Father in his private chapel late at night, sitting with the Lord, often writing in a notebook, preparing an encyclical or other work. Or they would find him prostrate in front of the Eucharist for hours on end. He had a comfort and a sense of being at home in front of the Lord. We can do a physical action that brings our heart along with the body. Fr. Matt said the translator of John Paul’s “Theology of the Body” once said that the Holy Father wrote that masterpiece at a desk that was in his chapel. The Holy Father’s tremendous love of the Blessed Mother is worthy of emulation. Before he entered the seminary, John Paul was introduced to St. Louis de Montfort and the total consecration to Mary, the prefect disciple and model for being the best disciple we can be. Almost everything he wrote, he turned at the end to the Blessed Mother for her intercession and mediation. The rosary was one of his favorite prayers. When he was praying he felt his prayers. He valued intercessory prayer. When the Holy Father visited the Philippines in 1995, he had an occasion to pray the rosary with a group. As the rosary ended, he took another 30 minutes to pray by name for specific bishops around the world and their intentions. Andreas pointed out that the bishops and priests John Paul prayed for were part of his work. Likewise, we can take that opportunity to pray for those we work with or to pray in our work. We are sent from Mass each week or each day to carry Christ with us to the world. When we go about our daily work, wherever it is, we can take the opportunity for prayer, to offer up our work to God. This is why John Paul is so inspiring, because he left us many ideas and ways to do this. Fr. Matt said our suffering can be a kind of prayer, whether it’s diseases or difficulties in life and in our work. The Holy Father helped us rediscover the value of redemptive suffering. The Holy Father himself suffered in the years after being shot in the early 80s. Andreas said the pope’s base state in life is prayer. He prayed, went to do his work, and then returned to prayer. The infusion of prayer in his life wasn’t forced, but an attitude that came naturally. Being a saint is what we’re here for. Becoming a saint is a decision we make and continue to make as we stick to the plan. Holiness is a part of life. It’s not about being gloomy or pietistic. Andreas said there was always so much laughter in the papal apartments. As a 20-year-old he was drawn to Pope John Paul because he wanted to be just like him. 4th segment: Discussing the extraordinary virtues of Pope John Paul II and the Church’s sense of his holiness. Scot said flowing from Pope John Paul’s prayer was how he treated people he encountered. Andreas told us during his last appearance on the show about how Pope John Paul, in his first encounter with the young Swiss Guard, saw how Andreas was hurting inside when others didn’t. When you perceive the world as God sees it, then you can see the basic human dignity of the person you encounter and you are present to them. Whenever you met Pope John Paul, you felt like he got out of bed that day just to meet you. He did that with everyone from presidents to the homeless. How he treated others then changed how everyone around him treated those people as well. Fr. Matt said grace builds on nature and John Paul’s human nature was so great. He was a healthy and vigorous man who loved so greatly. His humanity was a bridge by which people could encounter Christ. John Paul saw every person as a unique, unrepeatable soul, a masterpiece crafted by the hand of God. In our culture we get caught up with appearances, with what we do, with our education, etc. That didn’t matter to John Paul. And this is why so many flocked to him from all over the world. Andreas said the model of someone who is beatified shouldn’t be someone who is on a pedestal above, but that being like him is easy. That’s why John Paul made so many saints. We are all called to be saints and it is attainable for us. John Paul was like a coach who tells us that we are made for greatness and he can’t wait to see how far we will go. The coach is tough on you—“You can do better than that”. The coach doesn’t bend the truth for you in some false Kumbaya sense, dumbing it down for us. No, he says we can do better because we are made in the image and likeness of God. 5th segment: It’s time to announce the winner of this week’s WQOM Benefactor Raffle. Our prize this week is the “Messengers of Faith Talking Jesus and Mary Doll Set – Donated by BibleToys.com.” Children can learn more about Jesus and Mary as these dolls narrate their lives while children play with these 11” tall dolls. This week’s winner is Jacqueline Bouzan from Abington, MA. Congratulations to Jacqueline. 6th segment: Andreas is going to Rome this week for the beatification of Pope John Paul this Sunday. It’s a dream come true for him. Andreas was in Europe when John Paul died and was able to go the funeral, which was one of the most spiritually charged events of his life. It was an experience of the universality of the Church, with people from all over the world praying together in communion and receiving Communion. In other beatifications, people often had a devotion to the beati, but didn’t personally know them. But in this case, no other person in the world may have been as exposed to as many people as was John Paul. Andreas said John Paul’s spirit will be present as they celebrate John Paul as the vicar of Christ. It’s going to be just as much about being with the people around him at the event as it is about the beatification itself. Fr. Matt said for those who can’t be in Rome, keep in mind that it’s Divine Mercy Sunday, also May 1 which is usually the Feast of St. Joseph and the beginning of the month of Mary. We can imitate the Holy Father by entering into the Divine Mercy mystery, which was a powerful message promoted by John Paul. St. Faustina was the first saint canonized in the new millennium. Enter into the spirit of the day by embracing Divine Mercy. Andreas said in Europe, May is also Labor Day, and John Paul was himself a laborer. He was a stonecutter in a quarry in his youth. So on Sunday, we can contemplate our work and see how we can elevate our work into a prayer and find a spiritual meaning in it. Fr. Matt explained a little about the Divine Mercy devotion and St. Faustina. Jesus wanted us to embrace more deeply the mercy brought to us by the power of the cross. Even the worst sins can be blotted out by the mercy of God. God’s mercy is infinite and anyone who turns to Jesus can experience this great mercy. The Divine Mercy chaplet is prayed on the rosary beads. It was the wish if Jesus in those Divine Mercy messages to St. Faustina that the Sunday after Easter would be the feast of Divine Mercy. Andreas pointed out that John Paul died right after celebrating the Divine Mercy Mass in 2005.